You are currently browsing the tag archive for the ‘made from scratch cakes york pa’ tag. Pencils, Math Books, Apples, and Chalkboards line each Cupcake in this celebration of Teacher Appreciation Week at Leib Elementary in Dover, PA! Our Bakery had so much fun making each of the decorations out of Fondant. Yummy Cupcakes with edible themed decorations. The Cupcakes themselves were our Signature Chocolate Cake recipe with a Yummy white made from scratch Whipped icing (for all of the not so sweet icing lovers out there) and our Made from Scratch red buttercream icing. 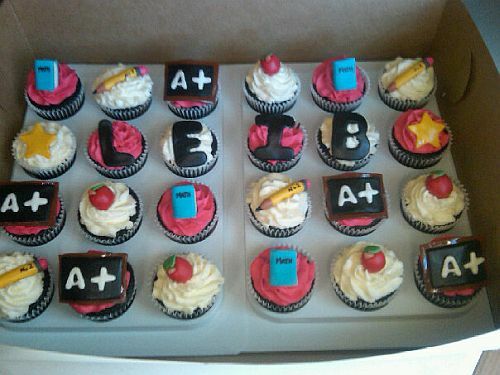 The cupcakes were delivered to Leib Elementary in Dover, PA Friday of last week for there Teacher Appreciation Week! What a fun way to celebrate Teacher Appreciation Week!